You’ve come up with a marketing budget for your company. But now what? Once you determine your ad spend in the digital marketing sphere, it can be daunting to figure how that budget actually breaks down. Google Ads, Facebook Advertising and other social media platforms, email marketing campaigns, and Search Engine Optimization (SEO) should all be focuses in your marketing plan, but how you break down each platform is up to you. There are a handful of considerations to look out for when you are creating a budget for each platform, but the main idea is to understand what your goal is, know the value of a click, and understand the tools that you need to use. No matter the platform, there is a general rule of thumb that you can follow to get more leads and turn those leads into conversions. Determining your end goal is the most important aspect of your campaign. Without a clear goal in mind, you may end up throwing money at different kinds of advertising and campaigns without generating any leads or conversions. Of course, there will be trial and error. Your business could find that engagement campaigns don’t perform as well as landing page view campaigns, and you get valuable leads anyway. Different campaigns will have different goals. You may be an up-and-coming restaurant in your town and need to bring awareness to your business. Or, you may have an online class that you need to drive traffic for. Coming up with accurate Key Performance Indicators (KPIs) will help you determine if you’re campaigns are on the right track. This is where the lead purchase funnel comes in handy. Demonstrating the natural loss of potential customers at each stage, the funnel shape shows how users can interact with your brand. Lead funnels can be broken down in different ways, but when it comes to online advertising, you may want to consider a funnel that looks like the one below. 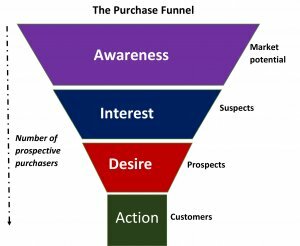 This is the general purchase funnel that tracks the consumer journey, from first contact to conversion. When it comes to marketing online, you’ll want to spend time and dollars on each aspect of the funnel, so that you can determine qualified leads. Part of your marketing budget is understanding how much you are willing to spend in order to get a click, lead, engagement, or other valuable action. In tandem with the funnel discussed earlier, different campaign engagements will be worth different amounts. If you are generating traffic to a landing page where you want your users to convert, you may be more okay with spending more money on each individual lead. If your goal is to drive conversation and engagement on your latest blog post, a lower CPC is what you may aim for. Knowing a loose CPC amount to stay under will help you as you run your campaigns so you can see any tweaks you may need to make. What tools or resources will you need? The right tools and the knowledge how to use them should be an integral part of your marketing budget. Spending dollars on digital marketing is useless if you aren’t familiar with the how of being successful. For Google Ads and SEO purposes, keyword research tools are going to insure that you aren’t throwing money into the trash. You’ll be able to get a good sense of what people are searching for, why they are searching for it, and where your business falls into their queries. For Google Ads and SEO, keyword research tools are going to be your number one resource to get the best ROI. Tools like Moz, Google Keyword Planner (free, but you need a Google Ads account), and BuzzSumo work to aggregate keyword information and let you make decisions based on the results. How does the time of year change ad spend? Especially if you are an e-commerce store, your ad spend will change depending on the time of year. If you’re like many e-commerce businesses, the fourth quarter will generally be where you make the most profits. Your goals during this period, like major conversions for Black Friday and Christmas, will determine where you spend your money. However, you’ll also need to think about your product and when your busy season is. If you sell inflatable pools and live in Minnesota, then spending excess money on Black Friday promotions may not be worth it to your bottom line. Determining your ad spend can be tricky, but we hope we’ve provided you with some good baselines to start with. Every business’s marketing budget will be different but overall there are some general rules you can follow to start seeing some success. It can be scary to start throwing money into the unknown, but having an actionable plan is the most important step to your overall digital marketing progress. Here is a good checklist for you and your marketing team to use in order to keep moving in the right direction with your PPC spend.